Second album of the „well dressed boys from Cologne“ released on Part Records. 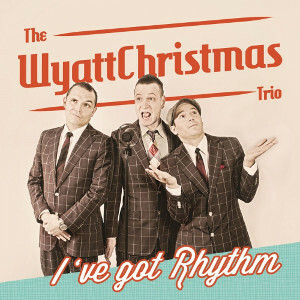 The classical rockabilly trio is not necessarily the direction: The band around guitarist, songwriter and singer Andy WyattChristmas can make this sound perfect in any case, but is much more in the focused on Rhythm and Blues, Swing, Jive and Jump Blues. And they do it at least live completely without horns and piano – although these are played occasionally by guest musicians as on „I’ve Got Rhythm“ to be heard. In addition the band is committed to their own composure and has really managed to write individual songs in yesterday’s style, including individuality and recognition value. Drummer Lee Diefenbach evolved as the second lead voice on the second album, which gives the trio more variety to the vocals. For The WyattChristmas Trio it means more than ever: Swing is much more important than tempo, and great vocal harmonies is big business here. Tip! Please notice: By pressing the button above you will leave this website and go to „rockabillyshop.de“ where you can buy our cd.